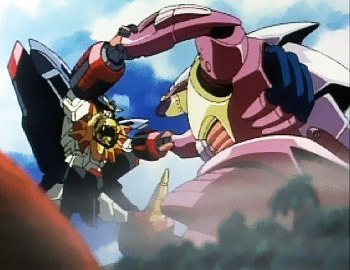 Here we see the robeast in the wild competing with its only natural predator, the Super Robot. Portmanteau of "robot" and "beast". The standard Monster of the Week for Super Robots and Super Sentai/Power Rangers. A Robeast is a Kaiju-sized monster, more often than not the same size as the Super Robot that battles it, though Robeasts in Toku may also start in human size, so as to be a threat on a personal scale, then grows through some form of Applied Phlebotinum. Robeasts are rarely capable of human-level intelligence or communication, and even when they are, they usually prefer to just roar instead. Robeasts are usually built with both biological and mechanical construction (though some are also completely mechanical, magical constructs, giant demons, and the like). They come in a dizzying variety of shapes, abilities, and weapons, and very rarely will any two robeasts look alike, even between robeasts deployed by the same villain(s). Many of them avoid humanoid designs and mook status, becoming a Mechanical Monster. They are almost always Made of Explodium. Not to be confused with Ambiguous Robots, though their design may sometimes imply they are this. Go Nagai's Mazinger Z is the Trope Codifier; in fact, the monsters in this series are actually called "Machine Beasts (Japanese Kikaiju). The sequel Great Mazinger had Battle Beasts (Sentoujuu) and UFO Robo Grendizer had the Saucer Beasts and Vega Monsters. And the Battle Beasts from Great Mazinger already diferred from the Mazinger Z Robeasts, bordering on a Deconstruction from the trope. They were capable of speech and independent thought, and they were very cunning due to it. This resulted in a Near-Villain Victory in the THIRD chapter. And sometimes Mazinger Z averted or subverted the trope. Some Mechanical Beasts were size-shifters, and some of them -Blazas S1 and S2- were human-sized. Voltron is the Trope Namer, after the monsters in GoLion and Dairugger XV. The equivalent terms were Deathblack Beastmen (then Mechablack Beastmen) in GoLion and Combat Machines in Dairugger XV. The Zonder and later Primevals from GaoGaiGar (EI-13 pictured above). The Angels from Neon Genesis Evangelion. Four Angels subverted the trope by not being giant at all: Leliel is infinitely thin, Bardiel and Iruel are microscopic (the former is The Corruption, while the latter is a colony of sentient nano-viruses), and Tabris/Kaworu is human-sized or just a Half-Human Hybrid, it's not really clear. The Mimetic Beasts from Shinkon Gattai Godannar!! The Beastmen Ganmen / Gunmen and the Anti-Spiral Mugann from Tengen Toppa Gurren Lagann. Gunmen are also an inversion, because the heroes use the exact same kinds of robots they stole from the beastmen. Slightly inverted in that the Mechasauruses, like much of the Reptilians, are a highly intelligent race. Mostly inverted with some Android/Cyborg Digimon. They're mainly made up of network data and are highly-intelligent, but some still counts. S-1 machines of the Aldebaren Army in Space Warrior Baldios. Renegade Units in Saber Rider and the Star Sheriffs. Numerous monomakia from Brigadoon: Marin and Melan fit this trope. The minions of the Shadow Angels, usually cherubim, in Genesis of Aquarion. Kyoshin in Neo Ranga, although somewhat subverted as they stay in two episodes at a time and do not start showing up until episode 17. The True Companions of Gaiking and Gaiking: Legend of Daiku Maryu fly around inside a gigantic mechanical dragon called Daiku Maryu. The Ganbare Goemon anime had Seppukumaru, the bad guy from the third Goemon game, summon creatures called "Cyber Devils" to fight the eponymous Mystical Ninja and his allies. Despite resembling organic monsters, they were actually mecha piloted by either Sepukkumaru himself and/or his egg shaped underlings. Advice and Trust: The cast fights Angels, giant alien monsters with Eldritch Abomination traits, but due to the changes in the relationships between the three pilots, the battles are very different from canon. In chapter 3 shows up an Angel made up by the writer. It is based on Sahaquiel: it is an enormous, floating, heavy thing that plummets downward and tries to crush Tokyo-3 under its weight. In chapter 7 appears another originally created Angel. It is called Megrael, it looks like a winged Evangelion and it remained airborne while shooting light beams. Children of an Elder God: At the beginning the Angels fought by the main characters seem to be just weird, massive aliens monsters, although very ancient and slightly eldritch. Then it is revealed that they are full-blown Eldritch Abominations and there are worst things behind them and their attacks. Doing It Right This Time: The Angels -giant alien monsters- of canon, fought in the original timeline. Now the main characters have returned to the past, the battles have become quite different. HERZ: In a chapter the cast had to fight an illegal Eva built secretly by the Chinese Government. It looked like the mutated offspring of a Mechanical Beast and an Evangelion. Higher Learning: The cast fights the giant aliens called Angels per canon. Unlike canon, though, Bardiel got killed before having the chance to seize Unit-03, and the pilots never met it. Last Child of Krypton: Shinji -as Superman- and his pilot friends -driving giant robots- fight the Angels, alien Eldritch Abominations. In this crossover they had ruined other worlds before assaulting Earth: they wrecked Mars in the original fic, and Krypton in the second version. Neon Genesis Evangelion: Genocide features several artificial, man-made, brand-new Angels: the first was named Samael, the second was a massive blob of inky darkness, and the third one was a clone of Kaworu. In Once More with Feeling, the canonical Angels seem to be stronger than their canon selves after the timeline got rebooted. The One I Love Is: The Angels -or Messengers-, giant alien monsters sporting all kind of shapes and abilities. Nearly all of them keep their canon selves, but Tabris. He is a her in this story. Scar Tissue: The giant alien Angels had been all killed before the beginning of the story, but a Russian black project had used samples of their DNA to create another massive monster. In order to destroy it, the main characters have to repair and reactivate their last giant robot left. Superwomen of Eva 2: Lone Heir of Krypton: The Angels from canon -humongous Eldritch Abominations-. Unlike than in canon, though, Asuka can fight them without her Humongous Mecha thanks to her Kryptonian DNA. Thousand Shinji alters the Angels' origins and natures so they fit in with the Warhammer 40,000 side of the crossover. The original form of Mechagodzilla from Godzilla franchise. The second version was a human piloted mecha. The third version was a human piloted mecha built on the bones of the original Godzilla, dubbed Kiryu. Kiryu went berserk in its first confrontation with (a second) Godzilla, playing with the trope. Then there's the cyborg Kaiju Gigan, the original Moguera (the second M.O.G.U.E.R.A. was, again, a human-built mecha), and Mecha-King Ghidorah. From the Toho-produced King Kong Escapes comes Mechani-Kong, who beats Mechagodzilla by some 7 years, but comes a full decade after Moguera. Toku such as Super Sentai (and by extension Power Rangers) revolve around this, with a different rubber suit Monster of the Week to challenge the heroes (and oftentimes the heroes' giant robots) as the driving force behind the villain's scheme. Every Big Bad has his or her own way of making monsters, and making them bigger. They're sometimes the source of Nightmare Fuel, and sometimes Narm Charm. Sentience and whether or not they're Always Chaotic Evil varies from series to series. Partial example with the Ultra Series, as most of the kaiju are more in the vein of Godzilla than Super Sentai, while the Ultras are aliens instead of robots. Nevertheless, they inspired a great deal of the examples here, and a number of the monsters fought by the heroes fit the trope in some way or another. They're not all one-off Monsters of the Week either, with many becoming as every bit as popular and iconic as Ultraman himself. Pretty much everything in Monsterpocalypse. For extra fun, the same company has released completely-compatible Voltron units, so the game has actual Robeasts. Meka Dragon in King of Tokyo. Most of the Rahi fought by the Toa in the first year of BIONICLE qualify, such as Manas, Muaka and Nui Rama. Predaking and Abominus from Transformers. Any Super Robot Wars game has one or more of the above series included, so it's a given. Except for the Original Generation series, which still manages a less "of the week" variant with the Einst. The Shura attempt a more direct homage with their animal-themed mecha, but they have soldiers as pilots. They also get giant space flounder monsters living amidst the asteroid belt. Drache, the first boss from Einhänder seems to fit. The background story notes that its AI emulates beasts' behaviors. Hence why the robot roars when you defeat it. Don't forget Ausf A Gestell, the mad ape mecha which roars in its intro, every time it's knocked down, and upon death. Robot Alchemic Drive has the Volgara. Reapers from Mass Effect are what happens when a whole army of Robeasts invade the galaxy and there are no Super Robots to save the day. Axiom Verge has the Variants, which are revealed in the Story Breadcrumbs to be mutated clones of Athetos. They emit metallic-sounding growls when the player encounters them in Boss Battles. South Park — In the Kaiju parody episode, Barbra Streisand turned into a Mechagodzilla. And returned in "201" with full sentience. The Rabbot and the Insanoflex from Aqua Teen Hunger Force. Parodied in one episode of The Grim Adventures of Billy & Mandy where Grim takes Billy (who has been transformed into a 100-foot-tall superhero) to Tokyo to meet a spoof of Gamera and Ghidorah. An angry Mandy pilots a giant gorilla robot called Mega-Gorillasaur to bring them back. As Voltron: Legendary Defender is a reboot of the Trope Namer; of course they show up. But in this case, they are much nastier threats than the ones the Paladins usually face and often entire episodes are dedicated to taking them down. They're not even named until Season 2, when Hunk panics at facing another "robot... beast! Ro-beast!" Unfortunately, there are also significantly downplayed — they stop appearing altogether shortly after the second season, leaving a paltry four Robeasts in the entire 78-episode run. The mecha-Stock Ness Monster in the Inspector Gadget episode "Monster Lake".